Notes: Your file is uploaded immediately. If you upload a small file, this happens very quickly. If you upload a large file, you may see a status bar and you may have the opportunity to cancel the upload process. If you cancel an upload before it is complete, the original file is not modified. When you see the Details tab, you can make changes to the file, if necessary. Specifically, you can rename the file and add tags to it. You can also upload another version of the document. Note: You do not need to upload the file again. Your new version is already uploaded. You can also switch to the other tabs to add attributes, view the audit trail, and share the file. If you make any changes to the file, click Save. 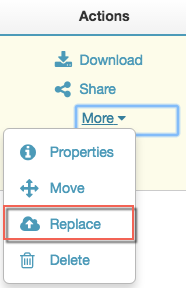 If you did not make any changes to the file, click the home icon.